Frances Barber says that her family lived on the Dundas Highway from the spring of 1946 to late in 1949. She remembers going inside an old, dark, dusty abandoned building with her brothers and other neighbourhood children. On the floor of this old building were shoe heels and soles as well as papers scattered around. The thought is that perhaps it had been manufacturing shoes or shoe parts in the 1930s or earlier, perhaps even for World War I. The picture here shows the large farmhouse (not the Barber family cabin) with the old one story factory building immediately to the north of it. 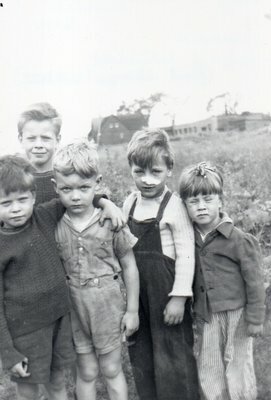 The children are: left back is Edward, brother Ray is in front, the fair-haired boy's name is not yet remembered, David Willett has a large BandAid on his nose and Frances is on the right. The Barbers were living in a three room cabin on the property which was Lot 9, Concession 1, NDS. This translates to a street address of about 1091 Dundas Street East, Oakville (in 2017 this is east of Eighth Line, across Dundas from the east side of the plaza (Shopper's Drug Mart store) on the north-east corner of Dundas Street and Prince Michael Drive). 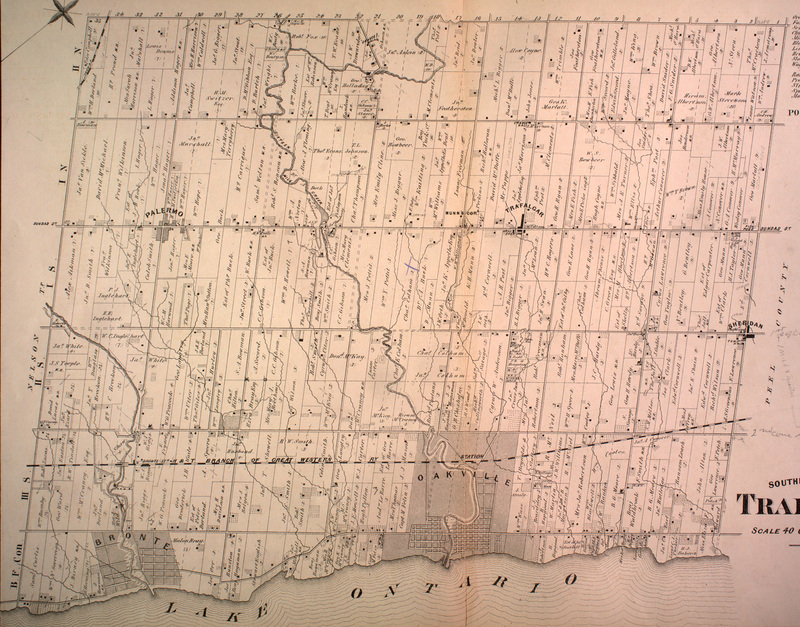 Their cabin was southeast of the orchard and large house which shows on the 1880 Tremaine's Map as being situated a bit north of the south west corner of the property with the house on the east side of the orchard, which was closer to the west Lot line - the Barbers were closer to Dundas Street. The small creek that ran behind the house often dried up in hot weather. They rented from a Mr. Levine, or a name like that. Lot 9, Concession 1 NDS runs from Dundas up to Burnhamthorpe Road. It was originally owned by Hugh Coyne which matches what the Barbers know. A link to the Tremaine's is in this record for your further information. Frances and her brothers remember it being a difficult time for her family. The cabin had no hydro or indoor water. The boys pumped water from the well by the big house several times a day. The brothers remember walking down the long driveway from the house to Dundas Street, then west along Dundas to the 8th Line where a school bus picked them up to go to Munn's School.